The irresistible new standalone from Sophie Kinsella is a story of love, empowerment and an IOU that changes everything . . . Fixie Farr canÃ¢Â€Â™t help herself. Straightening a crooked object, removing a barely-there stain, helping out a friend . . . she just has to put things right. ItÃ¢Â€Â™s how she got her nickname, after all. So when a handsome stranger in a coffee shop asks her to watch his laptop for a moment, Fixie not only agrees, she ends up saving it from certain disaster. To thank her, the computerÃ¢Â€Â™s owner, Sebastian, scribbles her an IOU Ã¢Â€Â“ but of course Fixie never intends to call in the favour. 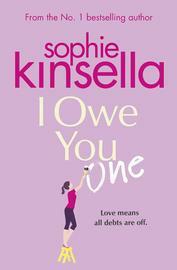 That is, until her teenage crush, Ryan, comes back into her life and needs her help Ã¢Â€Â“ and Fixie turns to Seb. But things donÃ¢Â€Â™t go according to plan, and now Fixie owes Seb: big time. Soon the pair are caught up in a series of IOUs Ã¢Â€Â“ from small favours to life-changing debts Ã¢Â€Â“ and Fixie is torn between the past sheÃ¢Â€Â™s used to and the future she deserves. Does she have the courage to fix things for herself and fight for the life, and love, she really wants?